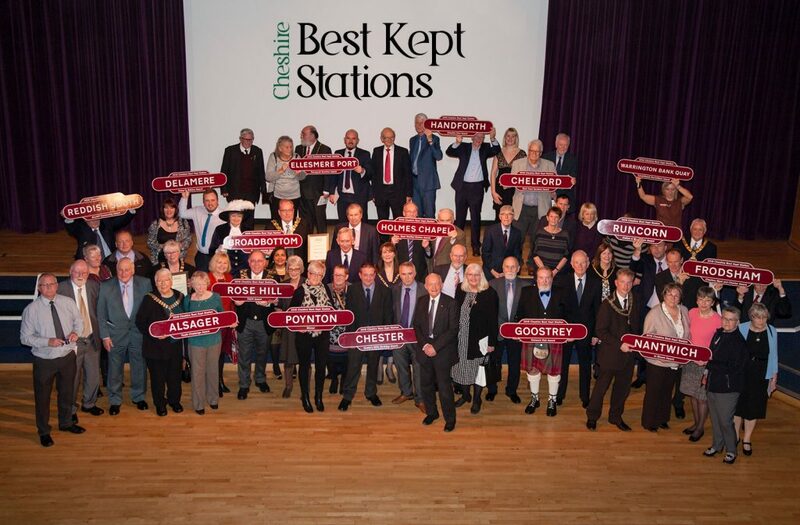 Cheshire Best Kept Stations was founded by Cheshire businessman, John Hulme, who saw the potential for community involvement in Cheshire’s local stations and recognised the need to motivate and inspire people. John organised twelve annual Awards Evenings before standing down in 2015, but not before finding a group of volunteers with railway and community backgrounds. They stepped forward to organise the 2015 Awards and subsequently set up Cheshire Best Kept Stations as an unincorporated voluntary organisation. 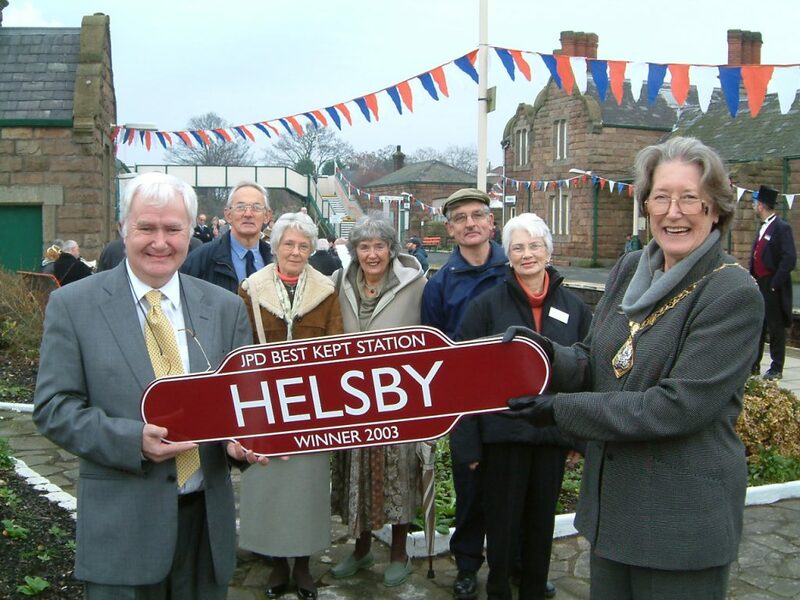 The first winner of Cheshire Best Kept Stations was Helsby Railway Station in 2003. The award was presented on the station by the then Mayor of Vale Royal Borough Council, Cllr Val Godfrey. Cllr Godfrey commended the work of North Cheshire Rail User Group who cared for the station. The station was clad with buntings and JPD Mereside Brass entertained those present on the station. Following the station ceremony, refreshments were provided and a cake was cut at Helsby Methodist Church. 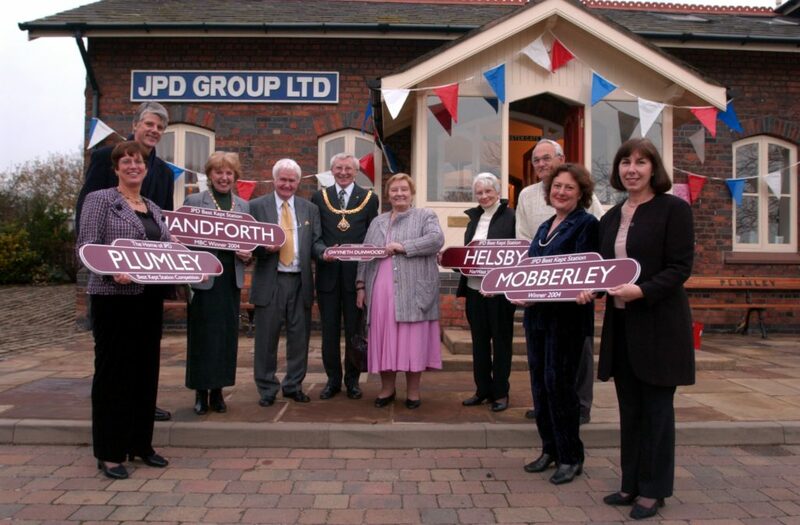 Helsby went on to win many awards which are proudly posted on their signal box. In 2003 commendations were also given to Acton Bridge and Handforth stations. In 2004, Mobberley on the Mid Cheshire Line, was named Cheshire’s Best Kept Station and the awards were given by the late Dr Gwyneth Dunwoody who was MP for Crewe. Dr Dunwoody was Chair of the House of Commons’ Transport Committee at the time. Mobberley Station was cared for by the Mobberley Village Society. Awards in that year were also given to Handforth and Helsby Railway Stations. John sold the business in 2005 and the following year the awards ceremony was at the Zone at Northwich Railway Station. In that year the winner was Handforth Railway Station on the Crewe to Manchester Line and cared for by the Friends of Handforth Station. In 2006, to coincide with an Exhibition on the history of the Mid Cheshire Line, the Awards Evening was held at the then Salt Museum in Northwich which later was renamed Weaver Hall Museum. In that year Dr Paul Salveson gave the awards and Helsby was named overall winner for the second time. The Awards Evening was held at Weaver Hall until 2012, when the success of Cheshire Best Kept Stations meant a new venue was needed to accomodate the number of stations and guests attending. The 2012 Awards was a memorable evening with Lord-Lieutenant of Cheshire, David Briggs giving the awards. 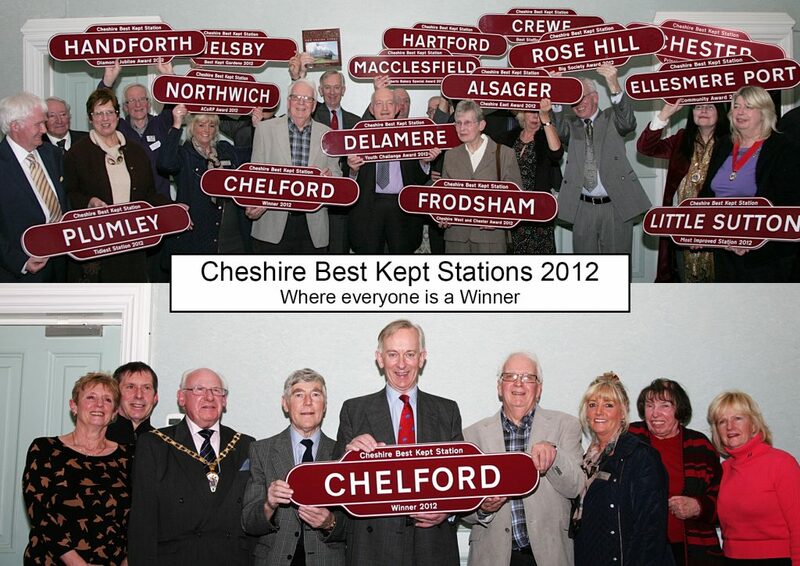 The event had grown to 15 awards with Chelford, on the Crewe to Manchester Line, being being named the winner. The 2013 Awards were held at the Grange Theatre, Hartford, Northwich which is a part of the Grange Independent School Complex. With theatre seating and leading edge technical facilities, the Awards Evening had now set the standard for station awards evenings. 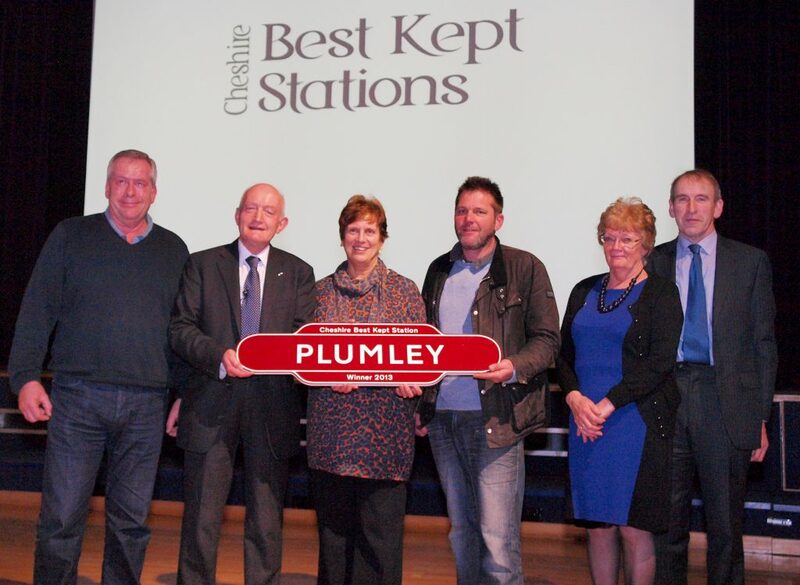 That year, Mark Barker, then with Northern Rail, gave the Awards and Plumley was named Cheshire’s Best Kept Station. In 2014, the awards took full advantage of the Grange Theatre’s facilities and before the Awards were given, a half hour presentation of Over by Christmas was given. This presentation had toured Cheshire’s stations during the previous year and commemorated the First World War at Cheshire’s Railway Stations. In 2014, Frodsham was named Cheshire’s Best Kept Station and Poynton won the World War One Commemoration Award. The Grange Theatre carries on to be used as the venue for Cheshire Best Kept Station’s Annual Awards Evenings.